The Avro Type 694, better known as the Avro Lincoln, is a British four-engined heavy bomber, which first flew on 9 June 1944. Developed from the Avro Lancaster, the first Lincoln variants were initially known as the Lancaster IV and V, these were renamed Lincoln I and II. It was the last piston-engined bomber operated by the Royal Air Force (RAF). The Lincoln attained operational status in August 1945. 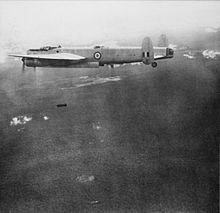 It had been initially assigned to units of the Tiger Force, a Commonwealth heavy bomber force which had been intended to play a role in the closing stages of the Second World War by participating in the Japan campaign with operations against the Japanese mainland; the war ended before the Lincoln went into action. Production of the type proceeded and the type was adopted in quantity, allowing it to complement and progressively replace the preceding Lancaster in RAF service during the late 1940s. The Lincoln was deployed on operations during the 1950s. 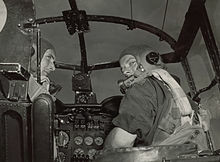 RAF squadrons equipped with the type were used as part of Britain's action against guerrilla fighters during the Mau Mau Uprising in Kenya; the RAF and the Royal Australian Air Force (RAAF) operated the Lincoln during the Malayan Emergency. 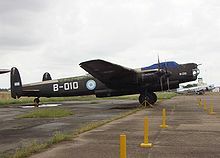 In addition to its wartime use, the type also saw significant service with the RAAF and the Argentine Air Force (Spanish: Fuerza Aérea Argentina). Lincolns also saw some use in civil aviation, often being operated as aerial test beds for aero-engine research. In RAF service, the Lincoln was replaced by a new generation of bombers harnessing newly developed jet propulsion. Chief amongst these was the English Electric Canberra, which was also adopted by a wide range of operators across the world including the RAAF and Argentine Air Force. During the 1950s, the RAF also adopted a total of three advanced jet-powered strategic bombers to carry Britain's new nuclear deterrent – collectively known as the V Force – the Vickers Valiant, Handley Page Victor and the Avro Vulcan. In 1967, the last Lincoln bombers in Argentinian service were retired. During early 1945, the British Government immediately set about restoring the country to a peacetime stance, which involved the demobilisation of the military and, more specifically, the disbanding of many squadrons of the Royal Air Force (RAF) as a part of cost-saving measures. A new emphasis was soon placed on 'quality over quantity' during the rationalisation process, seeking to employ fewer but more capable aircraft to perform their envisioned roles; while there was no longer any urgency in bringing new types of aircraft into service, limited procurement of equipment that fell within this ethos did proceed. 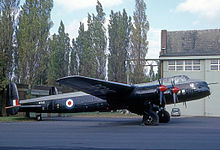 In accordance with this aim, the British Air Ministry proceeded to formulate and release Specification B.14/43, which sought an improved piston-engined heavy bomber to replace the wartime four-engine bombers, such as the Short Stirling, the Handley Page Halifax, and the Avro Lancaster. The Avro Lincoln originated from a design produced by Roy Chadwick as a development of the earlier Lancaster bomber which had been produced with the purpose of conforming with the requirements of the Specification B.14/43. Known initially as the Lancaster IV and Lancaster V, the envisioned aircraft, while bearing considerable similarity to the Lancaster, featured numerous improvements, such as the adoption of stronger, longer span, higher aspect ratio (10.30 compared with 8.02) wings along with two-stage supercharged Rolls-Royce Merlin 85 engines fitted within Universal Power Plant (UPP) installations. The new bomber also possessed an enlarged fuselage that accommodated increased fuel and bomb loads and allowing for the carriage of up to 4.5 tons of various armaments and equipment fittings. As a result of these changes, it would possess a higher operational ceiling and longer range than its Lancaster predecessor, being capable of a maximum altitude of 35,000 ft (6.5 miles) and a maximum range of 4,450 miles. The prototype Lancaster IV, later renamed as the Lincoln I was assembled by Avro's experimental flight department at Manchester's Ringway Airport. According to aviation author Kev Delve, development of the Lincoln had proceeded relatively smoothly. On 9 June 1944, the prototype conducted its maiden flight from Ringway Airport. Testing of the prototype quickly proved it to have favourable flight characteristics. In February 1945, the first production Lincoln was completed. The type was mainly produced at Avro's Woodford, Cheshire and Chadderton, Lancashire factories; additional aircraft were also constructed by Armstrong Whitworth at their Coventry facilities. Separate production lines were also established in Canada and Australia, although, as a consequence of the end of the war, production in Canada was halted after only a single aircraft had been constructed. Production in Australia went ahead: the Lincolns that were manufactured there were operated by the Royal Australian Air Force (RAAF). One Lincoln B Mk XV pattern aircraft was completed in Canada by Victory Aircraft; a follow-up order for a total of six RCAF variants was cancelled shortly following the end of hostilities. Along with two additional Lincoln (Mk I and Mk II) aircraft on loan from the RAF, the type was briefly evaluated postwar by the RCAF. The Lancaster V/Lincoln II differed mainly in that it was fitted with Merlin 68A engines. Prior to the Lincoln being developed, the Australian government had already formulated plans for its Department of Aircraft Production (DAP), later known as the Government Aircraft Factory (GAF), to construct the earlier Lancaster Mk III. In its place, it was decided to proceed with manufacturing a variant of the Lincoln I to replace the Consolidated Liberators, which was re-designated as the Lincoln Mk 30. This model was manufactured between 1946 and 1949; it has the distinction of being the largest aircraft ever constructed in Australia. Orders for a total of 85 Mk 30 Lincolns were placed by the RAAF, although only 73 were ever produced. The first five Australian examples (A73–1 to A73–5), were assembled at Fishermans Bend, Victoria using a large proportion of imported British-made components. On 17 March 1946, A73-1 conducted its début flight; the first entirely Australian-built Lincoln, A73-6, was formally delivered in November 1946. The Mk 30 initially featured four Merlin 85 engines, this arrangement was later changed to a combination of two outboard Merlin 66s and two inboard Merlin 85s. A further improved later version, designated as Lincoln Mk 30A, featured a total of four Merlin 102s. During the 1950s, the RAAF heavily modified some of their Mk 30 aircraft to perform anti-submarine warfare (ASW) missions, re-designating them Lincoln GR.Mk 31. These examples had a 6 ft 6 in (1.98 m) longer nose to house acoustic submarine detection gear and its operators, larger fuel tanks to provide the aircraft with a 13-hour flight endurance and a modified bomb bay to accommodate torpedoes. According to pilot feedback, the Lincoln Mk 31 was particularly difficult to land at night, as the bomber used a tailwheel and the long nose obstructed the pilot's view of the runway. In 1952, 18 aircraft were rebuilt to this standard, and were reallocated new serial numbers accordingly. [dubious – discuss] Ten were subsequently upgraded to the MR.Mk 31 standard, which included the adoption of an updated radar. Further aircraft were also derived from the Lincoln. A dedicated maritime patrol aircraft, designated as the Avro Shackleton, was developed for the RAF and the South African Air Force (SAAF). Additionally, Avro decided to develop a commercial airliner, known as the Tudor, which harnessed elements of the Lincoln, such as its wings, in combination with various new elements, such as the adoption of a pressurised fuselage, to perform passenger operations. During 1945, the Royal Air Force (RAF) received their first Lincoln, which was delivered to No. 57 Squadron based at RAF East Kirkby, Lincolnshire. In August 1945, No. 75 (New Zealand) Squadron began to re-equip with the Lincoln at RAF Spilsby, Lincolnshire. However, No. 75 (NZ) Sqn had received just three aircraft prior to VJ Day, and was disbanded quickly thereafter. During the postwar climate, the Lincoln quickly equipped the bomber squadrons of the RAF. Nearly 600 Lincolns were constructed to equip a total of 29 RAF squadrons, the majority of which were based in the United Kingdom. They were supplemented and partially replaced by 88 Boeing Washingtons, on loan from the USAF, which had longer range and could reach targets inside the Iron Curtain. Small numbers remained in use with Nos 7, 83 and 97 Squadrons until the end of 1955, at which point the type was phased out, having been replaced by the first of the V bombers. During the 1950s, RAF Lincolns participated in active combat missions in Kenya against Mau-Mau insurgents. During this action, they were operated from Eastleigh. The Lincoln was also deployed to Malaya during the Malayan Emergency, where they were used against insurgents aligned to the Malayan Communist Party. In Malayan theatre, RAF Lincolns were operated from Changi Air Base and Tengah Air Base. In excess of 3,000 sorties were flown during their ​7 1⁄2-year deployment, during which half a million pounds of bombs dropped. This equated to 85 per cent of the total bomb tonnage dropped during the Malayan emergency. On 12 March 1953, an RAF Lincoln (RF531 "C") of Central Gunnery School was shot down 20 mi (32 km) NE of Lüneburg, Germany by several Soviet MiG-15s as it flew to Berlin on a radar reconnaissance flight, resulting in the deaths of the seven crew members. In November 1955, four Lincolns of No. 7 Squadron RAF were detached for duties in British territories in the Middle East. In Bahrain, they carried out border patrols of the then Trucial States. When 7 Sqn was disbanded in December 1955, the four detached crews and aircraft became No. 1426 Flight RAF, officially a photographic reconnaissance unit. It was later sent to Aden, carrying out patrols in the lead up to the Aden Emergency. As the RAF Lincolns became unserviceable, primarily due to progressive wear and tear, they were replaced by a variety of jet-powered aircraft. The Lincolns of Bomber Command were phased out from the mid-1950s and had been completely replaced by jet bombers by 1963. The last Lincolns in RAF service were five operated by No. 151 Squadron, Signals Command, at RAF Watton, Norfolk, which were retired on 12 March 1963. From late 1946, Australian-built Lincolns were phased into No. 82 Wing, based at RAAF Base Amberley, Ipswich, Queensland. 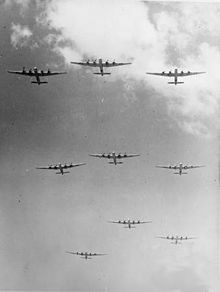 The type quickly replaced the Consolidated Liberator bombers that had been operated by 12, 21 and 23 Squadrons. In February 1948, these units were renumbered 1, 2 and 6 Squadrons respectively; a fourth RAAF Lincoln squadron, No. 10 was formed on 17 March 1949 at RAAF Townsville as a reconnaissance unit. During the 1950s, RAAF Lincolns participated in combat operations in Malaya, operating alongside RAF examples. The RAAF based the B.Mk 30s of No.1 Squadron at Tengah, for the duration of operations in Malaya. These Lincolns served with No. 10 Squadron at RAAF Base Townsville, Garbutt, Queensland; however, the discovery of corrosion in the wing spars led to the type's premature retirement in 1961. The Lincoln MR.Mk 31 was the final variant to see service in Australia. From 1947, the Lincoln bomber served with the Fuerza Aerea Argentina; Argentina had procured a total of 30 aircraft, together with a batch of 15 secondhand Lancasters. The adoption of the Lincoln effectively gave Argentina the most powerful bombing force in South America. Eighteen of these Lincolns were newly built, along with twelve ex-RAF aircraft. In 1947, the type entered service with I Grupo de Bombardeo of V Brigada Aérea. By the beginning of 1965, eleven of these remained in operational use, the majority of these were retired during the next year. In 1967, the final examples of the Lincoln were retired. The Argentine aircraft were used in bombing missions against domestic rebels. Lincolns were deployed during an attempted military coup conducted in September 1951, the type was also used by both the government and rebel forces during the 1955 Revolución Libertadora coup which resulted in Argentinian President Juan Perón being deposed. Argentinian Lincolns were also used to conduct supply airdrops in support of Argentine operations in the Antarctic region. 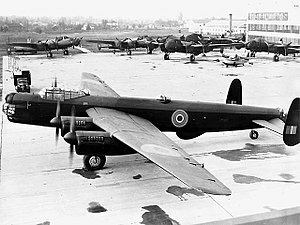 In 1948, one of the bombers was returned to Avro for modification at RAF Langar in Nottinghamshire in order to allow it to operate these Antarctic support flights; the changes included the addition of Lancastrian nose and tail cones, additional fuel tanks, and removal of armament; this led to the aircraft becoming the first Avro Lincolnian. Modified as such, the aircraft received a civilian registration and was named Cruz del Sur; it undertook its first aerial supply flight to the Antarctic San Martín Base in December 1951. Lincolns were frequently employed as testbeds in new jet engine development. RF403, RE339/G and SX972 flew with a pair of Armstrong Siddeley Python turboprops outboard in place of the Merlins, and was used for the ballistic casing drop-test programme for the Blue Danube atomic weapon. SX972 was further modified to fly with a pair of Bristol Proteus turboprops. RA716/G had a similarly placed pair of Bristol Theseus turboprops and later also flew with Rolls-Royce Avon turbojets replacing the pair of turboprops. Lincoln Test Bed RF530 kept its Merlins but had a Napier Naiad turboprop in the nose. It later flew, bearing the civilian "Class B" test registration G-37-1, with a similarly placed Rolls-Royce Tyne which it displayed at the 1956 Society of British Aircraft Constructors (SBAC) show, making a low level flypast on just the nose Tyne, the four Merlins being shut down and propellers feathered.SX973 had a Napier Nomad diesel turbo-compound installed in a similar nose-mounted installation. RA643 flew with a Bristol Phoebus turbojet in the bomb bay, and SX971 had an afterburning Rolls-Royce Derwent mounted ventrally. A pair of Lincoln IIs were operated by D. Napier & Son Ltd. for icing research from 1948 to 1962. A transport conversion of the Lincoln II, using the streamlined nose and tail cones of the Lancastrian and a ventral cargo pannier, was known as the Avro 695 Lincolnian. One Lincoln Freighter converted by Airflight Ltd. was used on the Berlin Air Lift by Surrey Flying Services Ltd.
Four Lincolnian conversions by Field Aircraft Services for use as meat haulers in Paraguay were not delivered and subsequently scrapped. Long-range bomber version for the RAF. Powered by four 1,750 hp (1,305 kW) Rolls-Royce Merlin 85 inline piston engines. Long-range bomber version for the RAF. Powered by four Rolls-Royce Merlin 66, 68A and 300 inline piston engines. Built by Avro, Armstrong-Whitworth and Vickers-Metropolitan. The Lincoln III was intended to be a maritime reconnaissance, anti-submarine warfare aircraft. The aircraft later became the Avro Shackleton. Lincoln II converted to Merlin 85 power. Lincoln II converted to drone aircraft, only two aircraft modified. This designation was given to one aircraft, built by Victory Aircraft in Canada. Long-range bomber version for the RAAF. Long-range bomber version for the RAAF, fitted with a longer nose and Australian manufactured Merlin 102s. General reconnaissance version of Mk.30 for the RAAF, fitted with a longer nose. Four Rolls-Royce Merlin 85 or 1,650 h.p. Merlin 102 powerplants. Anti-submarine warfare/maritime reconnaissance version of Mk 31 for the RAAF. Initial designation of the Avro Shackleton, which was based on the Lincoln. I Grupo de Bombardeo of V Brigada Aerea. Royal Australian Air Force – 54 Avro Lincolns were in service with the RAAF from 1946 to 1961. Three Avro Lincolns were in service with the RCAF from 1946 to 1948. No. 7 Squadron RAF 1949–55 at RAF Upwood. No. 9 Squadron RAF 1946–52 at RAF Binbrook, converted to the English Electric Canberra. No. 12 Squadron RAF 1946–52 at RAF Binbrook and RAF Hemswell, converted to the English Electric Canberra. No. 15 Squadron RAF 1947–50 at RAF Wyton, converted to the Boeing Washington. No. 35 Squadron RAF 1949–50 at RAF Mildenhall. No. 44 Squadron RAF 1945–51 at RAF Mildenhall and RAF Wyton, converted to the Boeing Washington. No. 49 Squadron RAF 1949–55 at RAF Upwood, RAF Waddington and RAF Wittering. No. 50 Squadron RAF 1949–51 at RAF Waddington. No. 57 Squadron RAF 1945–51 at RAF West Kirby, RAF Elsham Wolds, RAF Scampton, RAF Lindholme and RAF Waddington, converted to the Boeing Washington. No. 61 Squadron RAF 1946–54 at RAF Waddington and RAF Wittering, converted to the English Electric Canberra. No. 75 (New Zealand) Squadron RAF 1945 at RAF Spilsby. No. 83 Squadron RAF 1945–55 at RAF Coningsby and RAF Hemswell. No. 90 Squadron RAF 1947–50 at RAF Wyton, converted to the Boeing Washington. No. 97 Squadron RAF 1946–55 at RAF Coningsby and RAF Hemswell. No. 100 Squadron RAF 1946–54 at RAF Lindholme, RAF Hemswell, RAF Waddington and RAF Wittering, converted to the English Electric Canberra. No. 101 Squadron RAF 1946–51 at RAF Binbrook, converted to the English Electric Canberra. No. 115 Squadron RAF 1949–50 at RAF Mildenhall. No. 138 Squadron RAF 1947–60 at RAF Wyton and RAF Scampton. No. 148 Squadron RAF 1950–55 at RAF Upwood. No. 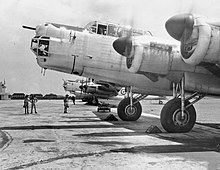 149 Squadron RAF 1949–50 at RAF Mildenhall. No. 207 Squadron RAF 1949–50 at RAF Mildenhall. No. 214 Squadron RAF 1950–54 at RAF Upwood. No. 617 Squadron RAF 1946–52 at RAF Watton, converted to the English Electric Canberra. Lincoln II B-004 – on display as B-010 at the National Museum of Aeronautics, Buenos Aires. Lincoln II B-016 – a gate guardian at the Villa Reynolds airbase, San Luis Province. Lincoln II RF342 is in storage for future restoration at the Australian National Aviation Museum, Melbourne. The nose section of Australian-made Lincoln B.30 A73-27 is at the Camden Museum of Aviation at Narellan, New South Wales. Lincoln II RF398 at the Royal Air Force Museum Cosford. Range: 2,800 mi (2,433 nmi; 4,506 km) at 15,000 ft (4,600 m) with 14,000 lb (6,400 kg) bomb load at 200 mph (170 kn; 320 km/h). 4,450 mi (3,870 nmi; 7,160 km) at 15,000 ft (4,600 m) with 3,000 lb (1,400 kg) bomb load at 200 mph (170 kn; 320 km/h). 2,240 mi (1,950 nmi; 3,600 km) at 20,000 ft (6,100 m) with 14,000 lb (6,400 kg) bomb load at 260 mph (230 kn; 420 km/h). 3,560 mi (3,090 nmi; 5,730 km) at 20,000 ft (6,100 m) with 3,000 lb (1,400 kg) bomb load at 260 mph (230 kn; 420 km/h). Guns: 2x 0.5 in (12.70 mm) M2 Browning machine-guns in a Boulton Paul Type F nose turret, 2x 20 mm (0.787 in) Hispano MK.IV cannon or Hispano Mk.V cannon in a Bristol B.17 dorsal turret and 2x 0.5 in (12.70 mm) M2 Browning machine-guns in a Boulton Paul Type D tail turret. Bombs: Up to 14,000 lb (6,400 kg) of bombs ; exceptionally 1 x 22,000 lb (10,000 kg) Grand Slam Deep Penetration bomb. ^ Using the Merlin 102 engine, an RAAF Lincoln was able to take off in 2,874 ft with an all up weight of 82,000 lb. A lightened Lincoln, using Merlin 114 engines, and carrying a rocket assisted bomb similar in size and weight to a 12,000 lb Tallboy bomb, was able to achieve 42,000 ft.
^ a b Mantelli, Brown, Kittel and Graf 2017, p. 58. ^ a b c d e Delve 2005, p. 248. ^ a b Mantelli, Brown, Kittel and Graf 2017, pp. 58–59. ^ a b Delve 2005, pp. 248–249. ^ Nathan, Stuart. "February 1946: the last of the piston-engined bombers." The Engineer, 4 February 2015. ^ a b c d Mantelli, Brown, Kittel and Graf 2017, p. 59. ^ Delve 2005, p. 249. ^ Scholefield 1998, p. 37. ^ "Avro Lincoln." Archived 5 December 2010 at the Wayback Machine airforce.forces.gc.ca. Retrieved: 30 August 2010. ^ "Avro Lincoln." Royal Canadian Air Force, Retrieved: 30 August 2010. ^ a b Jackson 1990, p. 412. ^ Mantelli, Brown, Kittel and Graf 2017, pp. 60–61. ^ a b c d e Mantelli, Brown, Kittel and Graf 2017, p. 61. ^ a b c d World Aircraft Information Files, 1997. ^ Jackson 1990, p. 406. ^ "Avro Lincoln B2." Royal Air Force Museum, Retrieved: 3 March 2015. ^ a b c Mantelli, Brown, Kittel and Graf 2017, p. 60. ^ a b Jackson 1990, p. 409. ^ Marino et al. 2001, p. 65. ^ Marino et al. 2002, p. 37. ^ Marino et al. 2002, p. 41. ^ Marino et al. 2002, pp. 40–41. ^ Marino et al. 2002, p. 39. ^ a b "A 61-year Operation Link, the first FAA flight over Antarctica." Archived 9 January 2013 at the Wayback Machine aeroespacio, Retrieved: 29 December 2012. ^ "Avro 694 Lincoln modificado Cruz del Sur." asociacionatta.com. Retrieved: 29 December 2012. ^ The National Archives, London, file ES 1/44. ^ "No. 4610. Avro 694 Lincoln B. Mk. II (G-37-1)." Maurice Collier Collection. Retrieved: 26 December 2009. ^ Franks 2000, pp. 97–99. ^ Mantelli, Brown, Kittel and Graf 2017, p. 63. ^ Mantelli, Brown, Kittel and Graf 2017, pp. 63–64. ^ a b Mantelli, Brown, Kittel and Graf 2017, p. 64. ^ Franks 2000, p. 88. ^ a b c d Mantelli, Brown, Kittel and Graf 2017, p. 65. ^ a b c Wilson 1994, p. 216. ^ a b c d e f g h i j k l m n o p q r s t u v w x Delve 2005, p. 251. 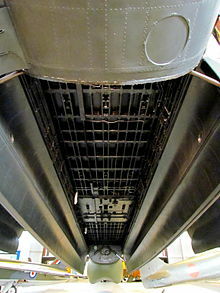 ^ a b c d "Individual History: Avro Lincoln B.2 RF398/8376M – Museum Accession Number 84/A/1182." Royal Air Force Museum, 2012. ^ "33°44'00.0"S 65°23'00.0"W." Google Maps, Retrieved: 3 May 2015. ^ Bridgman, Leonard, ed. (1947). Jane's all the World's Aircraft 1947. London: Sampson Low, Marston & Co. pp. 22c–23c. ^ Thetford, Owen G. (1979). Aircraft of the Royal Air Force since 1918 (7th ed.). London: Putnam. pp. 69–70. ISBN 9780370301860. ^ Garbett and Goulding 1979, p. 95. ^ Garbett and Goulding 1979, p. 70. ^ a b c d e f g h i j Mason, Francis K. (1994). The British bomber since 1914. Annapolis: Naval Institute Press. pp. 355–358. ISBN 9781557500854. ^ a b c d "The Avro Lincoln". Flight and Aircraft Engineer. Vol. XLIX. (No. 1934): p.p.58-62. 17 January 1946. Retrieved 11 April 2019. Buttler, Tony. Avro Lincoln (Warpaint series no. 34). Denbigh East, Bletchley, UK: Hall Park Books, 2000. Delve, Ken. Bomber Command: 1936–1968: An Operational & Historical Record. Pen and Sword, 2005. ISBN 1-47381-259-3. Franks, Richard A. The Avro Lancaster, Manchester and Lincoln. Bedford, United Kingdom: SAM Publications, 2000. ISBN 0-9533465-3-6. Garbett, Mike and Brian Goulding. Lincoln at War. Shepperton, Surrey, UK: Ian Allan Ltd., 1979. ISBN 0-7110-0847-7. Lake, Alan. Flying Units Of The RAF. London: Airlife Publishing Ltd., 1999. ISBN 1-84037-086-6. Lake, Jon. Type Analysis: Avro Lincoln International Air Power Review, Volume 1, 1997, Airtime publishing. ISSN 1473-9917. Marino, Atilo, Vladimiro Celleto and Javier Mosquera. "Argentina's 'Heavies': Avro Lancaster, Lincoln and Lancastrian in Military Service: Part One." Air Enthusiast, No. 95, September/October 2001, pp. 64–70. Stamford, UK. Key Publishing. ISSN 0143-5450. Marino, Atilo, Vladimiro Celleto and Javier Mosquera. "Argentina's 'Heavies': Avro Lancaster, Lincoln and Lancastrian in Military Service: Part Two." Air Enthusiast, No. 97, January/February 2002, pp. 36–43. Stamford, UK. Key Publishing. ISSN 0143-5450. Scholefield, R.A. Manchester Airport. Stroud, Gloucestershire, UK: Sutton Publishing, 1998. ISBN 0-7509-1954-X. Thetford, Owen. Aircraft of the Royal Air Force 1918–57. London: Putnam, 1957. Wilson, Stewart (1994). Military Aircraft of Australia. Weston Creek, Australia: Aerospace Publications. ISBN 1875671080. World Aircraft Information Files, File # 022. London: Bright Star Publishing Ltd., 1997. Benedetto, Fernando (2009). Núñez Padin, Jorge Felix, ed. Avro Lancaster, Lancastrian & Lincoln. Serie Fuerza Aérea (in Spanish). 17. Bahía Blanca, Argentina: Fuerzas Aeronavales. ISBN 978-987-1682-00-3. Archived from the original on 2011-09-22. Wikimedia Commons has media related to Avro Lincoln.